What is Chapter 7 Bankruptcy? | The Law Office of Emil Fleysher, P.A. What is Chapter 7 Bankruptcy? | The Law Office of Emil Fleysher, P.A. Home Blog Bankruptcy What is Chapter 7 Bankruptcy? The Federal Bankruptcy Code provides several different types of bankruptcies that can be filed. The most common type of Bankruptcy is located in Chapter 7 of the Bankruptcy Code. 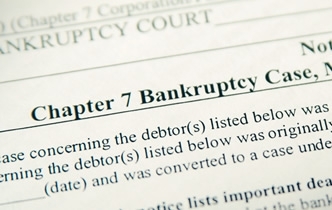 A Chapter 7 bankruptcy comes from the 7th chapter of the bankruptcy code. It is also known as the “liquidation” bankruptcy because the Trustee has to liquidate, or sell, all nonexempt property in order to repay your creditors. The majority of individuals who file for Chapter 7 get the keep their property, however there are some states that are more charitable than others. The process normally takes about 3 months and requires only one meeting outside of court with the Trustee. The trustee is the official selected by a bankruptcy judge to process your case. Bankruptcy has a law known as the Bankruptcy Abuse Prevention and Consumer Protection Act (BAPCPA) that requires filers to take a “means” test. This test is to certify that filers who have “disposable” income are forced to file for Chapter 13 instead. However, most people who file for Chapter 7 do not have “disposable” income and therefore continue to file as such. Before filing, you will need to consult with a nonprofit credit counseling agency. The idea of this consultation with the credit counseling agency is to check if there is an attainable way, without falling deeper in debt, for you to manage your outstanding balances without filing for bankruptcy. After completing the counseling you can begin to file your case. The first thing your attorney will do is file for a “Voluntary Petition”, which is the official form that asks the court to pardon your debts. There is a packet of forms that will need to be completed along with an extensive list of required documents, but there is no need to fret because your attorney will take care of the majority of the forms on your behalf. Once this has been filed an “Order of Relief” will be put in place by the court, which will cause your creditors to cease the harassment calls, at least for some time. During the time that your case is open, you cannot sell or give away any of your property. A notice will be sent advising you when and where the meeting of creditors is going to take place by your trustee. This is usually out of the court room and you will be asked a few questions, under oath. As long as you have answered everything truthfully and you have past the means test, you should have a favorable outcome.